Is Jacqueline Ray Lesbian ? The former actress & model Jacqueline Ray is best known for being the ex-wife of actor Tom Selleck. The ex-couple had tied the knot in 1971 but after 11 years of relationship separated in 1982. Ray has appeared in movies like "In Like Flint" in 1967, "The Killings at Outpost Zeta" in 1980 and "Beyond the Universe" in 1981. Besides she has been cast in Television series, "Unfabulous" and "Unfabulous: The Best Trip". Jacqueline Ray was born Jacqueline Mary Ray on July 17, 1952, in Burbank, California, United States. Potraying the actress, Jacqueline Ray. Her childhood details and education background is not mentioned. Jacqueline Ray is professionally an actress and model who has appeared in movies like, In Like Flint in 1967, The Killings at Outpost Zeta in 1980 and Beyond the Universe in 1981. Jacqueline Ray receiving an award. The actress was cast in the 2006 Television series Unfabulous and the next year again appeared in its spin-off Unfabulous: The Best Trip Ever. She also had a very decent modeling career and worked as a model in the 1960s. The model and actress Jacqueline Ray's net worth is not estimated but some sources claim it to be $500,000. She has earned a decent income from her involvement in Television series and was a very popular model in her early days. While her actor ex-husband Tom Selleck is estimated to have a net worth of $25 million and $45 million according to The Richest and Celebrity Net Worth. He takes home a salary of $150 thousand per episode for his appearance in Television series. Jacqueline Ray is currently single and not involved in a relationship with anyone at the moment. She has been married thrice in her lifetime. Ray was first married to a man named Shepard with whom she had her first child named Kevin Selleck who was born in 1966. After her separation from her first husband, she then tied the knot to actor Tom Selleck on May 15, 1971, and he adopted her child Kevin. The couple was together for 11 years but due to some problems in their marriage, they divorced on August 10, 1982. After her two failed marriages she remained single for some time. 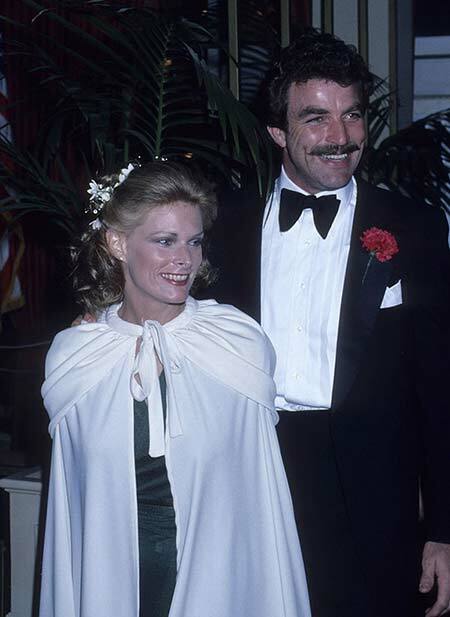 Jacqueline Ray with ex-husband Tom Selleck. But later on, after meeting Clarence Barry Witmer she decided to marry for the third time and they exchanged vows on March 21, 1992. But like her rest two marriages, this also didn't last for long and they ended up getting a divorce. Her son Kevin is an actor who has appeared in Scream 2, Magnum P.I and later on, married Annabelle Selleck. Age: As, of 2018, she is 66 years old. Height: She stands at a height of of 5 feet 7 inchess tall (1.70 m). Weight: She weighs an average weight. Ray was first married to a man named Shepard with whom she had her first child named Kevin Selleck who was born in 1966. After her separation from her first husband, she then tied the knot to actor Tom Selleck on May 15, 1971, and divorced on August 10, 1982. Ray decided to marry for the third time and exchanged vows with Clarence Barry Witmer on March 21, 1992.